A bunch of tired and restless kids wait patiently. Or at least, appear to. After what seems like an endless wait, the moment arrives. School bells ring intensely thereby declaring the end of a long day. Silence gives way to the cacophony of ecstatic children. Like honey bees, we come out buzzing from every corner of the school. As we make our way out of the school gate, street food hawkers greet us with big smiles, some freshly prepared food and a lot of enthusiasm! Some call out to us by our first name. They are all set to make their daily sale and we are more than happy to oblige! It is extremely difficult to resist such wide variety of street food. We were faced with a moral dilemma – to snack or not to snack. No amount of hygiene education on the part of our parents or teachers helped, ever! Undoubtedly, snacking on street food was the unanimous choice! 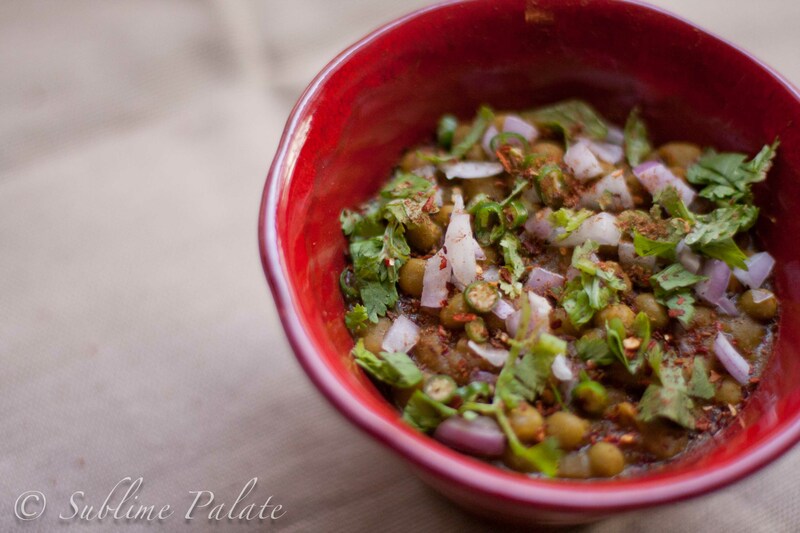 When you have aromatic chaats, savory and spicy delights tempting you, you can’t possibly walk away from it! I couldn’t. Not then. 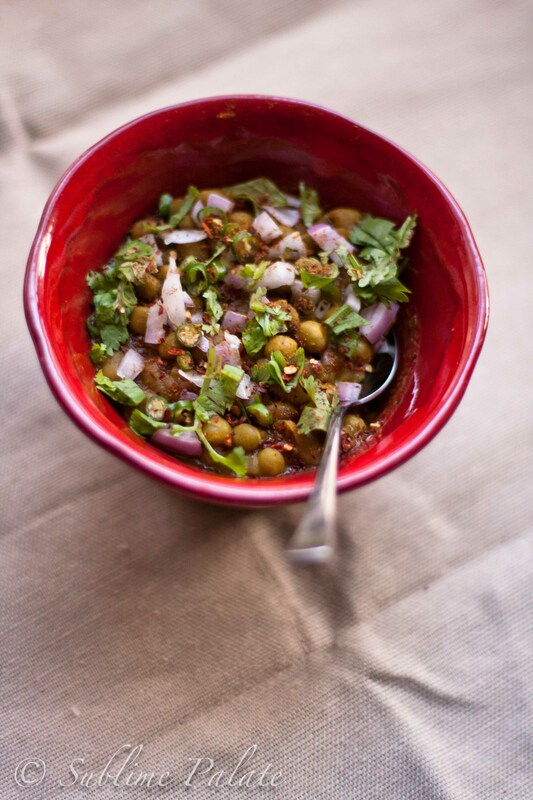 One such snack was ghugni (dried peas soaked in water, boiled and then cooked with spices, garnished with onions, green chillies, coriander leaves and a blend of spices). The combination of tangy and spicy is what makes it extremely desirable! “Sankara” was THE man who introduced me to ghugni during my school days. A small-built, modest man, with a striking long moustache – that’s how he looked like as far as I can remember. He didn’t, by any means, sell the best ghugni but he was definitely one of the most popular ones probably because his ghugni was the most conveniently available! It was available at the right time and right place for street-food-starved children who were waiting to dive into all that junk as soon as we were out of school boundaries. I can confidently say that generations have grown up on his ghugni and will never be able to forget him for that experience. Sankara has become a legend in my eyes and probably in the eyes of most of most of my school mates. 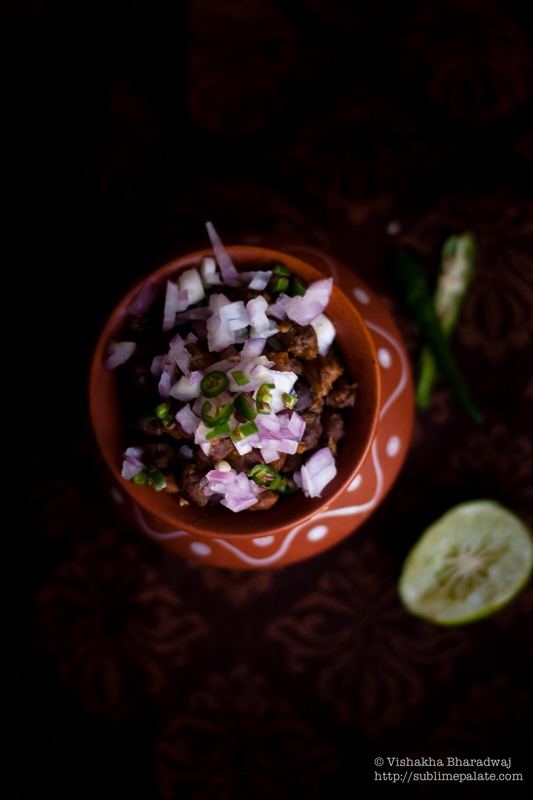 Ghugni is a very popular snack from the Eastern part of India. It’s made in many different ways using dried green peas, dried yellow peas, chickpeas (chhole), black chickpeas (kala chana) and fresh peas. I have made it with dried green peas. Feel free to use any other type of peas but bear in mind that the soaking and cooking time for each of the above is different. To print the recipe, click ghugni. Tamarind pulp: roughly equivalent to 1 tbsp dissolved in 1/2 cup of warm water. Hot water: 2 cups for soaking the dried peas. More water may be needed depending on the consistency of your ghugni. Roasted and powdered Cumin Powder (In a pan, on slow heat, dry roast cumin seeds until they become darker. Let it cool. Dry grind it to a powder. I usually make more (about 1/2 cup) and store it for future use). Roasted and powdered Dry red Chilli (In a pan, on slow heat, dry roast about 10-15 dry red chillies until they turn dark and before they start to burn. Let it cool. 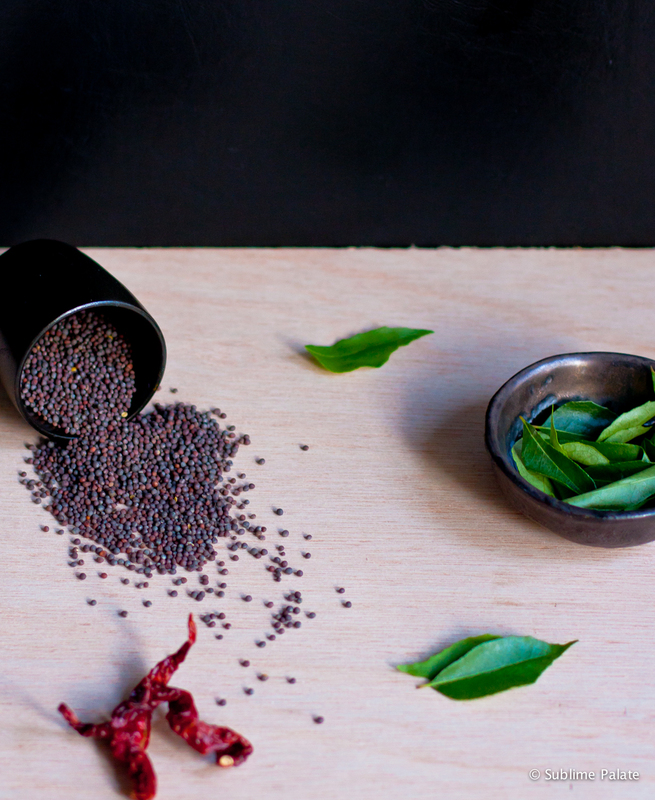 Dry grind or pound to make chilli flakes or coarsely grounded red chilli powder. Again, this can be stored for future use). 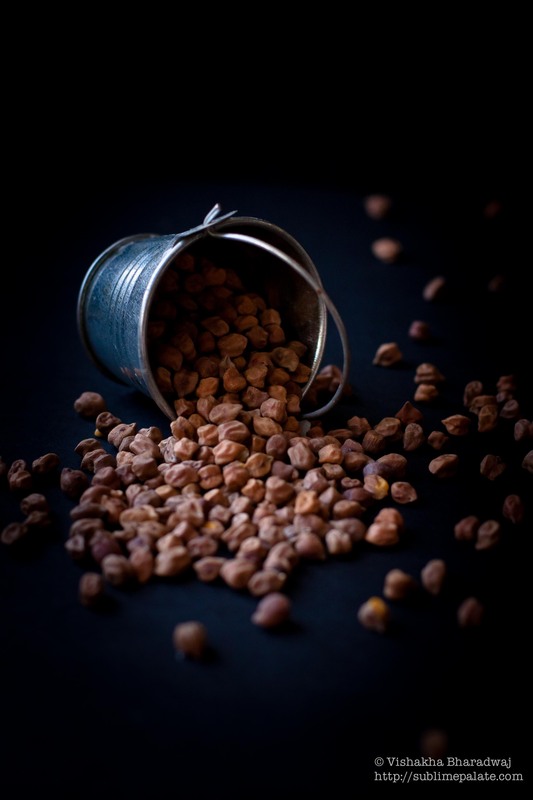 Wash the dried peas in tap water. Soak them in enough hot water to cover the dried peas. Cover and set aside. At the end of 2 hours, you will notice that the peas swell up in size. 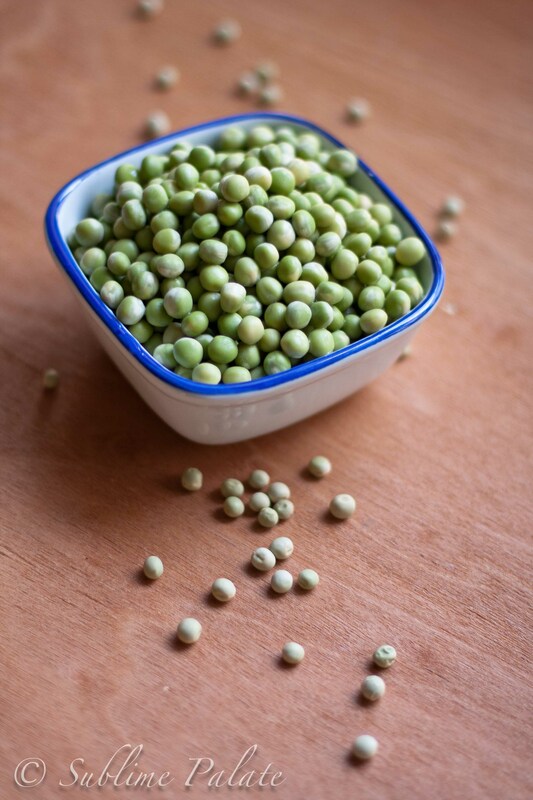 Boil the soaked peas in a pressure cooker with 2 cups of water and a pinch of salt for 10 mins. Check if peas are done and boil uncovered, if needed. They should be soft but not mushy. Next add the chopped onions and 1/4 tsp of salt. Fry on medium-high heat until the onions are golden brownish. Keep stirring in between to make sure it does not burn. This may take 6-8 minutes. Add the ginger and garlic paste. Continue to fry for another minute. Add the spice paste made above (turmeric, chilli powder and cumin powder in water). Fry for another minute. 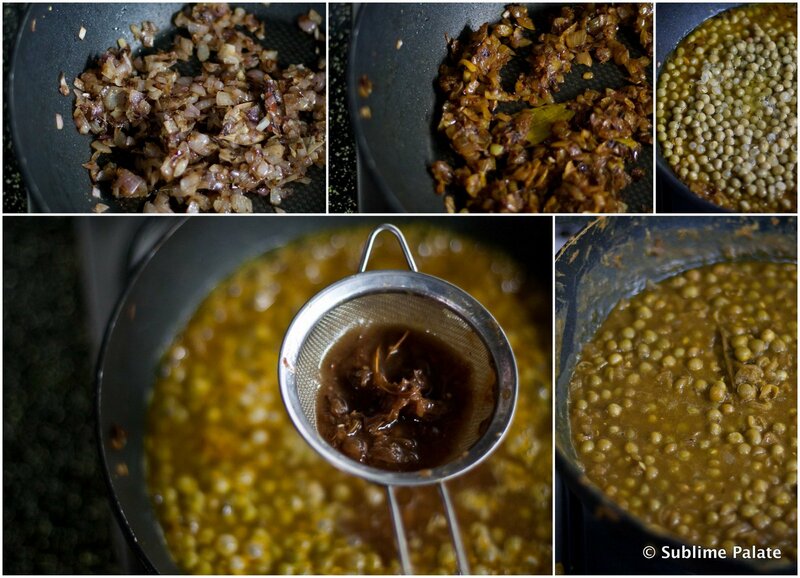 Add the boiled peas along with the water left over from boiling into the cooking pot or kadhai. Using a strainer, strain the tamarind juice adding the juice and excluding any seeds or fibres. Rub the tamarind with your fingers to make sure you extract any left over pulp. Stir and check for salt, tangy and spicy flavors. Adjust to suit your liking. Boil on low heat, covered, for about 7-8 minutes or until the flavors have combined. Sprinkle garam masala powder and check for salt and spice. Adjust if needed. Cook for another 2-3 minutes until the ghugni is done. 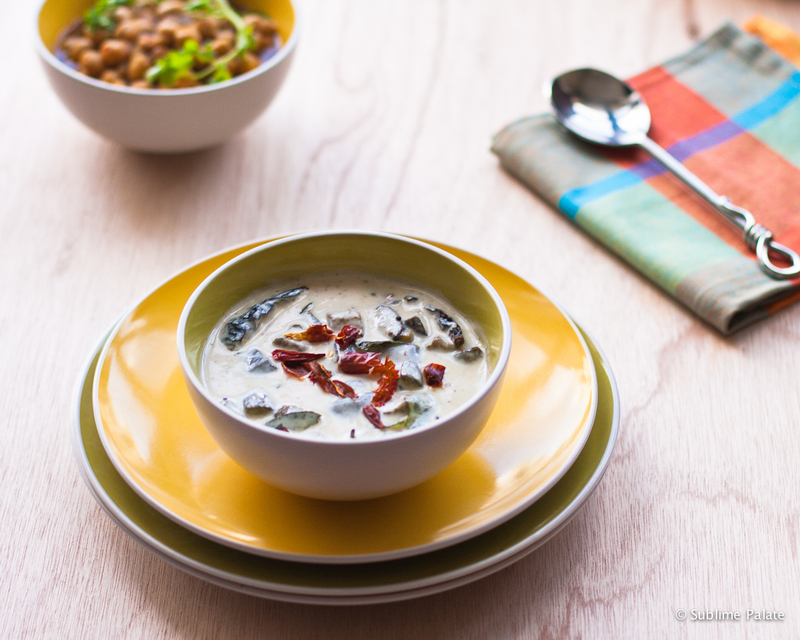 Take about ¾ cup of hot ghugni in each serving bowl. 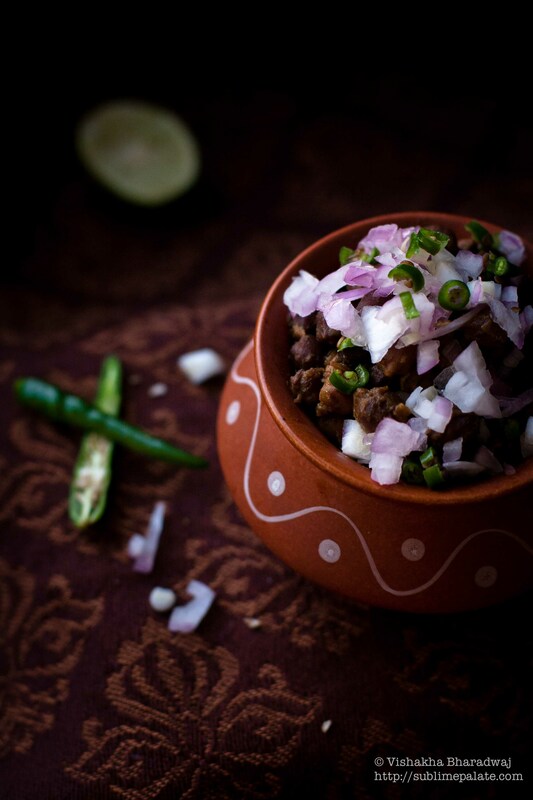 Sprinkle about 1 tbsp of chopped onions, ¼ tsp green chillies and 1 tsp of chopped coriander leaves. Sprinkle a pinch each of black salt, roasted cumin powder and chaat masala. And it’s ready to eat. The quantities mentioned in the serving suggestion above are just to give you a rough idea. The beauty of this snack is that you are able to adjust each ingredient to your liking. Finish the ghugni experience with a hot cup of tea. The garnish is a very important part of this snack. So, do not skip or ignore any of the ingredients. Dried Green peas cook very fast once they have been soaked. Do not pressure cook them for more than 10 minutes. Else, they may become really mushy! You can always boil them more later once you have checked. The peas should be soft without losing it’s shape. It should not disintegrate. If you have soaked them for longer than 2 hours in hot water or for more than 4 hours in normal water, boil them for a shorter period in a pressure cooker or boil them in a pan instead of a pressure cooker to make sure it doesn’t get overcooked. If you do not serve it immediately after cooking, you may need to add some hot water and give it a boil before serving to make sure the ghugni is not dry. 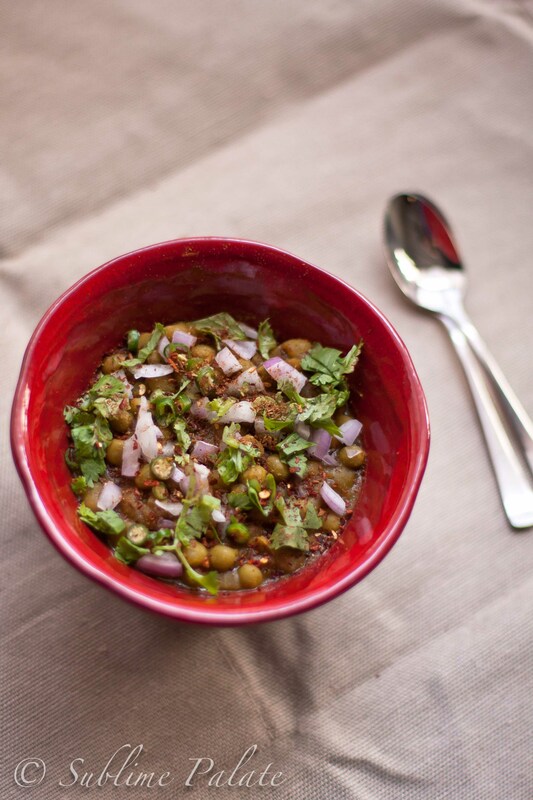 The peas tend to absorb the curry when left for some time so you may need to add more water just before serving. Check for salt if you have added more water. 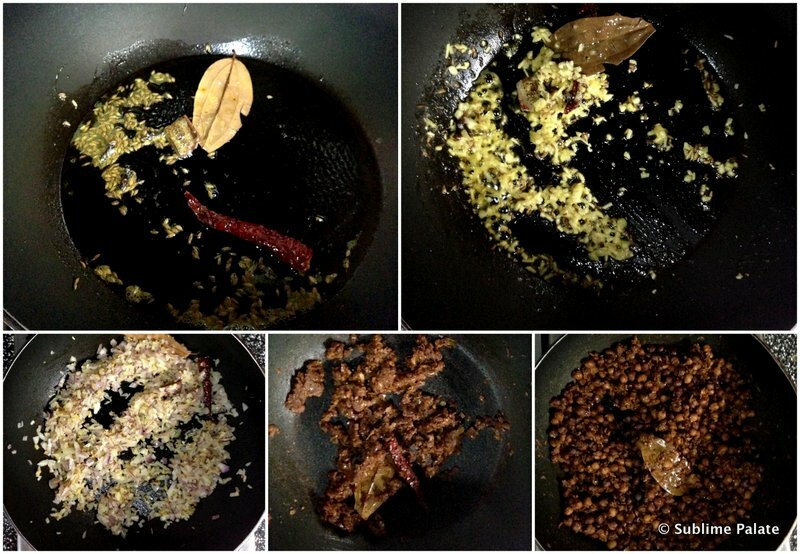 If you need to add more water once the ghugni is cooked, use hot water to speed up the cooking process. 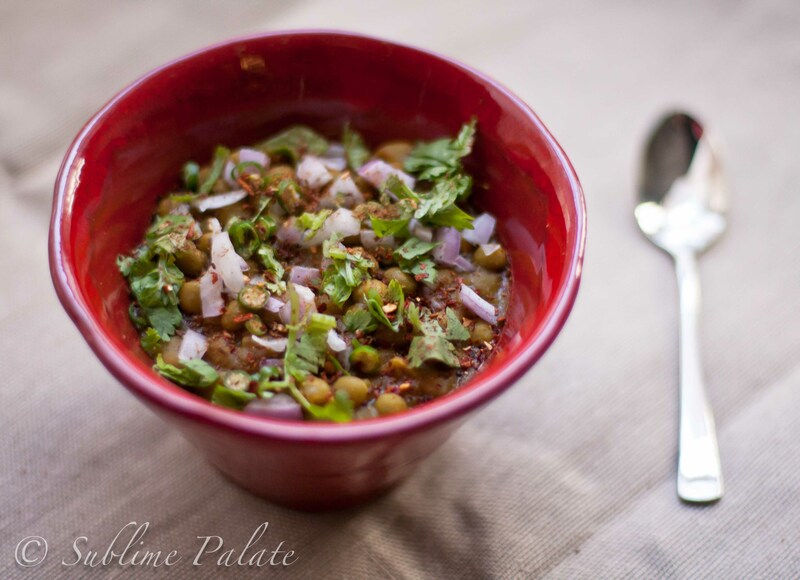 Optional: Green chutney serves as an additional garnish on this dish! 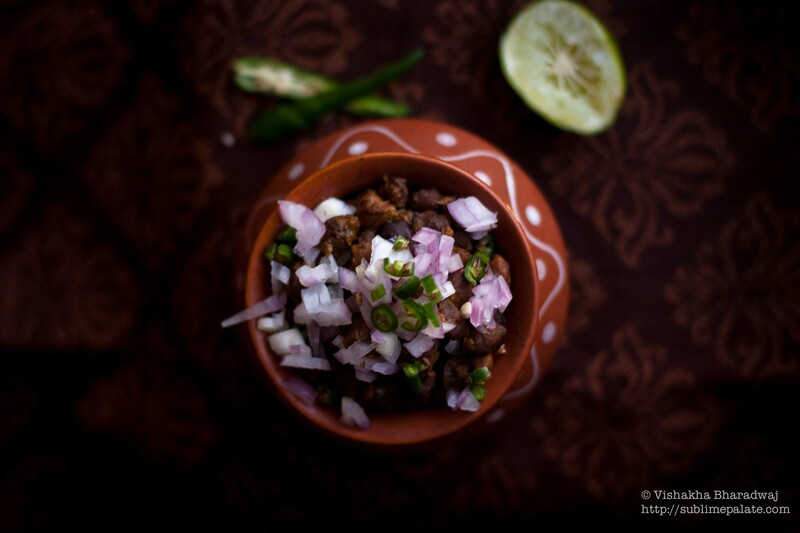 Some people like to have it with a bit of yogurt or add tamarind chutney on top. Regional and authentic cuisine has been a subject of interest amongst historians and foodies alike. 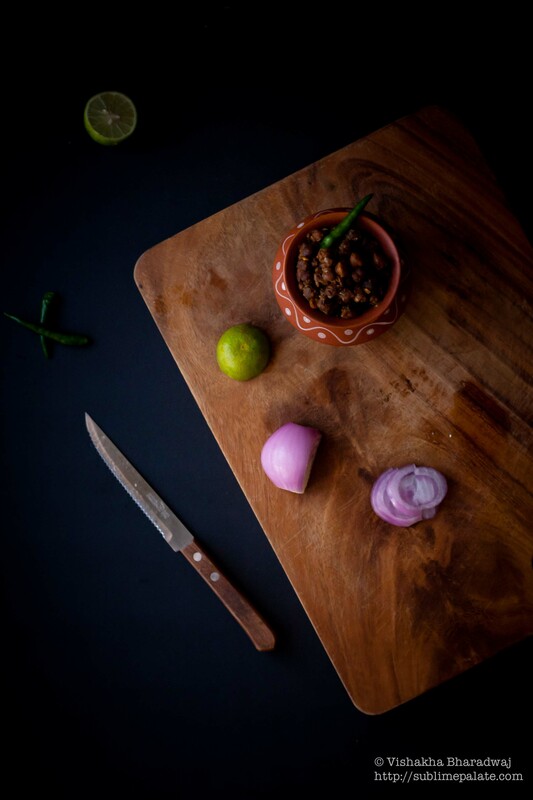 As much as I appreciate and treasure a traditional dish for it’s originality and authentic flavors, the next generation and perhaps, to some extent, many of us have contributed in blurring the lines between authentic and fusion food. Having been exposed to various cultures, the food that we eat or cook today at home is influenced by these cultural differences. 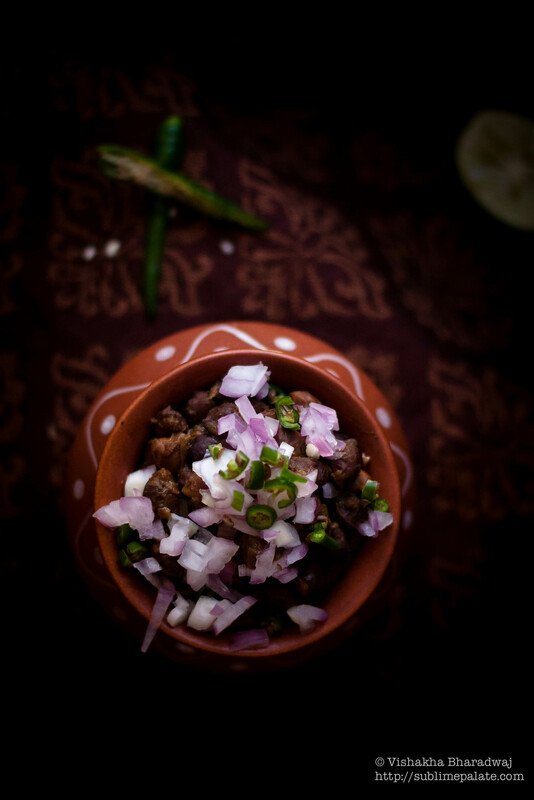 Over a period of time, these regional recipes have become internalized by families who have adopted it and in due course given it a place in their “family recipe book”. The other effect that is a result of this migration process is a certain loss of identity of the original recipe, other than those documented by historians or food enthusiasts. The migration of food is not a new phenomenon by any means. However, as the world becomes smaller, recipes are now only about two-clicks away. The evolution and migration of recipes seems much more fast-paced than ever before. A traditional dish from Peru if made with ingredients which are easily available, would very likely make its way to the kitchen of a family living in a remote town in India. In all likelihood, they would have improvised an Indian version of that dish and perhaps that would be a favorite of the youngest member of the family ! Today’s recipe goes back to my roots and has a nostalgic feel to it. 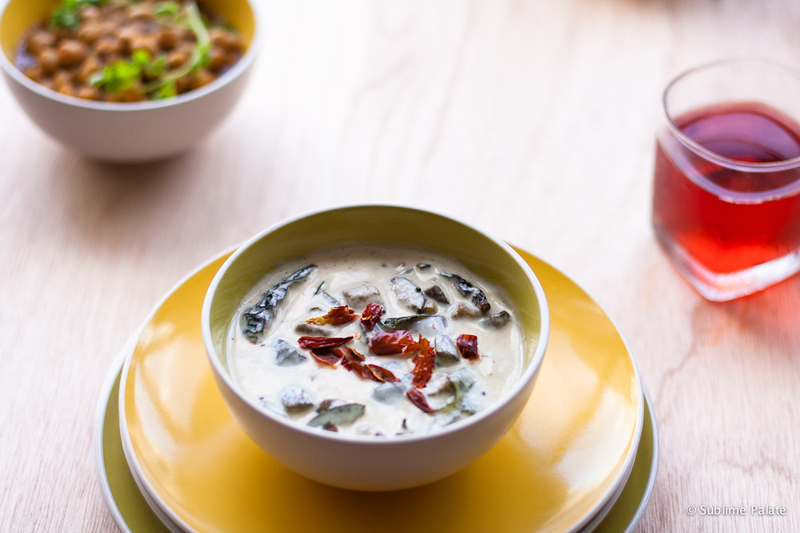 A simple yet delectable dish made mostly in this form in Odisha (Orissa) and Bihar : Spiced Yogurt with eggplants or Baingan ka Raita. 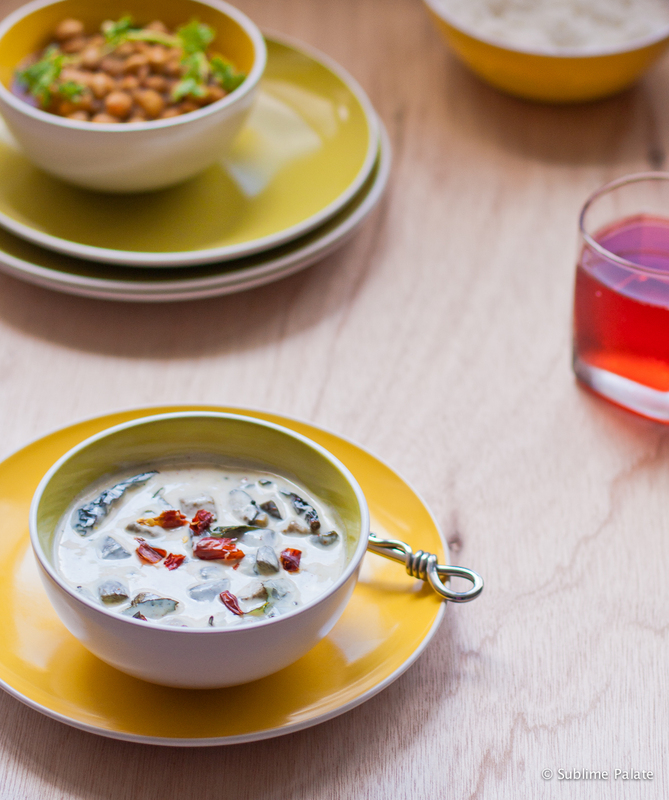 Having grown up under the influence of both Oriya and Bihari cuisine, Baingan Raita was made at home often and has been one of my favorite ways of having yogurt. A Raita [pronounced rahy-tuh] is a condiment made with Yogurt as the base with spices and some vegetables. 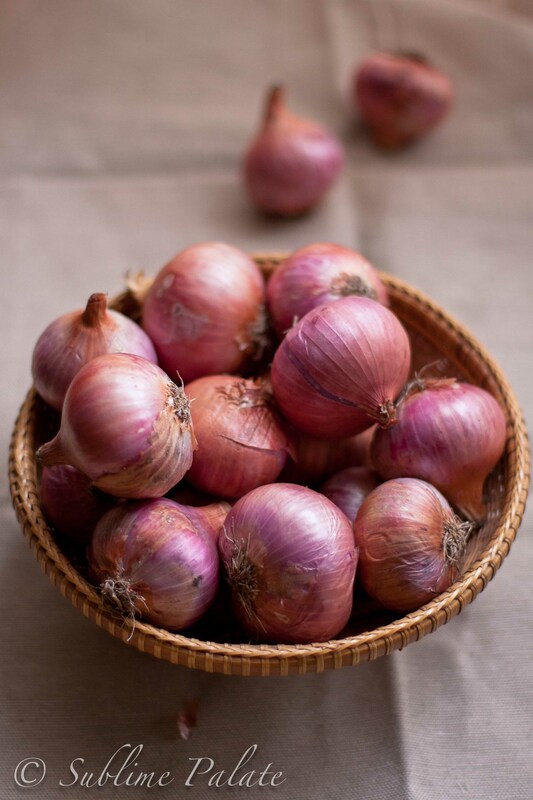 It’s made all over the Indian sub-continent in many different combinations but most commonly with onions, tomatoes and/or cucumbers. Wash the eggplants thoroughly. Add turmeric and 1/4 tsp salt and leave aside for 5 mins. In a Kadhai or frying pan, heat 1 tbsp oil. Add hing, mustard seeds and dry red chillies. Wait till mustard seeds pop. Next, add curry leaves. Stir for about 10 seconds and add the Eggplants. 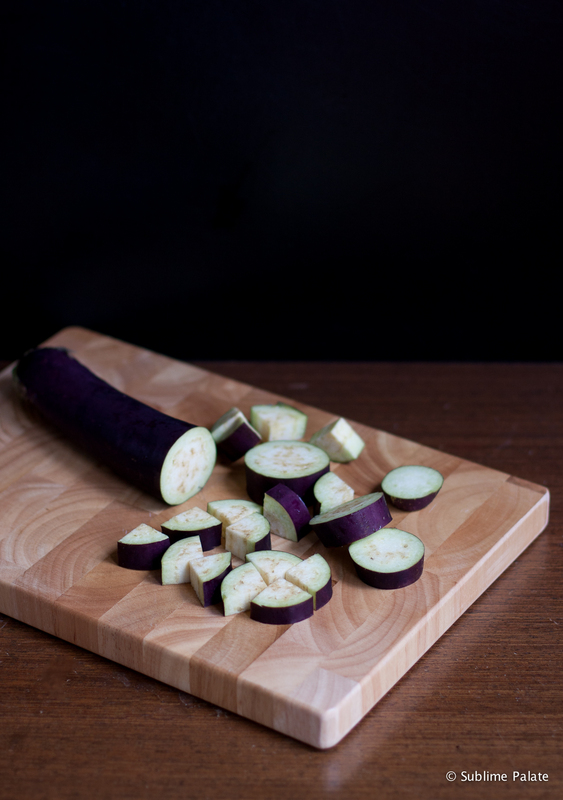 Cook uncovered on medium-low heat until the skin is roasted and the eggplants are cooked but not mushy or breaking. Once done, take it out in a serving bowl and let it cool (5 – 10 mins). 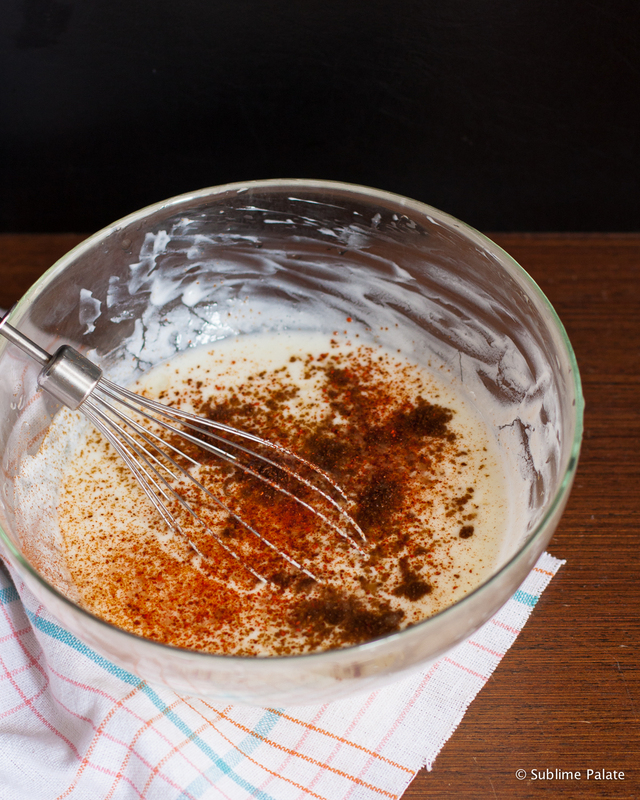 In a bowl, whisk the yogurt using an egg whisker or spoon into a creamy smooth consistency. Add the milk. Mix it together. Add roasted Cumin powder, Chilli powder, salt (1/4 tsp) as well as Black salt. Mix it into the yogurt. Once the fried eggplants have cooled off, pour the yogurt mix into the serving bowl. Combine everything together using a spoon (without mashing the eggplants). Let it chill in the refrigerator for at least 20 mins (or more) before serving. Enjoy as a side with any meal. I woke up rubbing my eyes.. Some one was banging on the door! It’s only 10:30 pm for heaven’s sake! Let me sleep, I mumbled.. I opened the door somewhat pissed off. It was my uncle. He had just returned from work. The tickets had arrived! But, it was 10:30 pm. I hadn’t even packed! I was leaving the country! This can’t be happening!! In the next 10 minutes, my mother dumped my essentials into a bag and we were on the road. It was a good 30 minutes drive to the airport. I went in to the check-in counter while the rest of my family waited outside the airport. It was closed. I pleaded, I almost cried. It had worked in the past. And, it did, again! A staff came back, opened the counter for me. Before I knew, I was through immigration! I was out of the airport in Bangkok, all alone, expecting to see my Dad. But, there was no one. Not for the next 10 minutes. Not for the next 30 minutes. I decided to call him using a public telephone. And suddenly it hit me! I had no money!!! Nothing at all. Not even a coin to make a phone call. In all the mad rush of last night, everyone forgot about money! I asked someone for help, all in sign language. This stranger gave me a coin and told me how to use the phone, all in gestures. I could not have asked for more!! And now.. for today’s recipe. This one is my mom’s favorite! She is a vegetarian and one that loves all her veges nice and crunchy! If you love your veges, you’ve gotta try this out! To print this recipe, click here. Cut the long beans, capsicum and carrot into 2″ long pieces. Carrots should be cut into thin and long pieces. Roughly cut the cabbage and green leaves into big chunky leafy pieces. Pound the garlic and chillies together in a mortar and pestle. In order to make fried rice, as far as possible, use left over rice from the fridge. When freshly cooked rice is used, it does not turn out the same way as freshly cooked rice tends to stick together into lumps. Heat a wok. Once hot, add the oil. When it gets smoky, add the pounded garlic and chilli mix into the oil. Stir fry for 30 seconds. If using onions, add sliced onions at this point. Let it turn translucent. Next, add the carrots and beans. Continue to stir on high heat. Reduce heat for 1 min to let the beans and carrot cook. Now add the cabbage, green leaves, capsicum and the torn kaffir lime leaves. Increase heat to high. Add the soya sauce. The smoke adds a nice flavor to this dish. It is important to stir this continuously to avoid the veges from getting burnt. This may take 30 seconds to a minute. 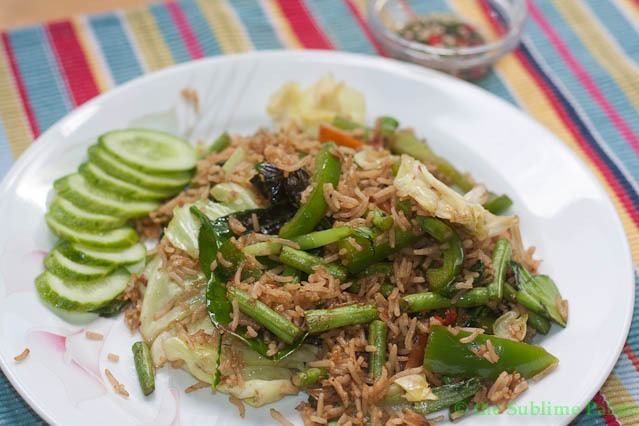 Once the veges are crunchy and cooked, add the bowl of cold rice, basil leaves and vegetarian oyster sauce. Stir continuously and on high heat. Check for salt and add more soya / vegetarian oyster sauce, if needed. Combine all the ingredients (on high heat). This may take up to 1 minute depending on the heat.